Ramadan 2016 is right around the corner for millions of Muslims worldwide. During this holy month, Muslims fast daily from sunup to sundown and use this holy month to become closer to their religion, family and community. When I am performing my Arabic storytelling sessions at local libraries, one of my favorite books to explain this requirement of Islam is the children’s book, My First Ramadan by Karen Katz. It tells a simple story of the Muslim celebration of Ramadan through the eyes of a small child. 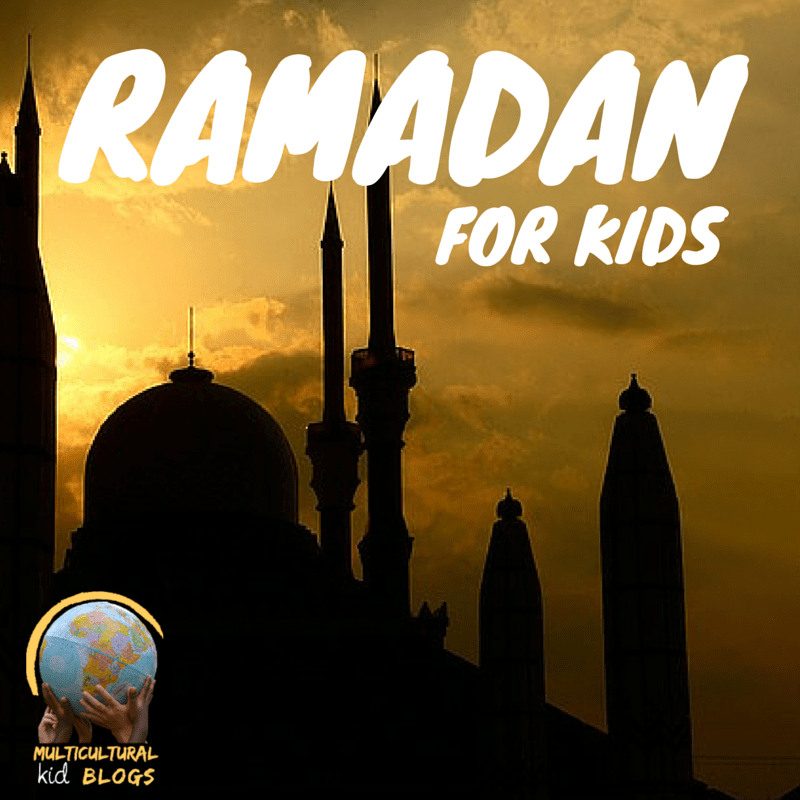 A few weeks ago, Multicultural Kid Blogs asked me to be part of it’s second annual Ramadan for Kids blog hop. This is where a few bloggers come together to share ideas about honoring this special month (feel free to follow our ideas – Ramadan board). Be sure to check out the rest of my fellow #MKBKids bloggers taking part of the Blog Hop at the end of this Mosque Pillow tutorial. Here’s the deal, I’m a fabric hoarder. I have shelves and shelves. I do go through once a year and clean out boxes to give to my local Buy Nothing group, but I still have drawers that look like this. I went through it all and picked out fabric in these colors to try to best match the ones in the book. I ended up not using that fringe and made a side trip to a fabric store for a better idea for the gold roof. Total cost for the whole project: $4 for the roof ribbon. Score. First thing I like to do with any project is set aside some time to do the layout. I keep this by my sewing machine to help remind me what the final will look like. After I have the basic visual down, I pinned my main fabric in half and used my quilting pencil to draw the design. I then took out my gauge and added another 3/4 inch all around the entire shape. I cut from this second, larger outline and set both pieces aside. To make my door and windows, I folded the fabric in half, used my rotary cutter to free hand a straight along one side and added a half } shape to the top. I cut out two more smaller, similar shapes for the inside of the door. For the windows, I did the same thing, but on a much smaller scale. I made two larger taller windows for the side of the door and four smaller windows. I also cut out two 3/4 inch borders for the top and bottom of the mosque and smaller 3/4 borders for under the windows. I placed all my pieces on the heat bond interface and carefully ironed them. I like to use a smaller iron because it allows me to place the heat where I need it. You can use a regular iron, but be careful the exposed interface might stick to your iron. I cut all the pieces out and set them aside. To make the decorations over the front door, I cut 1/2 inch squares from adhesive felt. These were so small, honestly I just didn’t want to try to sew them and used the adhesive felt out of laziness. If you are going to make this as a gift for a child, please use regular felt and sew these on so they don’t end up in someone’s mouth. Once everything is cut and ready, I took the backing off the interface fabric (but not the felt!!) and started playing around with the design. Once I liked the design, I ironed on my details. I then pinned down the outline ribbons and newly acquired gold roof ribbon (so worth that $4, right?) and set it aside. The mosque in My First Ramadan has a little cupola on top. I thought it might be fun to turn this into a tab to carry the mosque, or hang it from a hook. To create this tab, I cut out a little extra piece of fabric in a rectangle. I folded it in half lengthwise, headed to the sewing machine with it and my pinned mosque. I sewed on all the ribbon and added a few details to the boarders. I also sewed my tab along one side, on the long fold. Now it was ready to be folded in half and added to the top of my mosque. I make sure to put it’s raw edges along the same side as the raw edges of my dome. I placed my blank pillow frame over this decorated pillow frame, main sides facing each other, and pinned them together. Tip – when I pin a stuffie, I use colored pins as my starting and stopping points and regular pins everywhere else. I need to leave an opening to turn my pillow inside out and having the coloring pins there remind me. Sew all around the pillow, going twice over the tab for security. When I was done, I had a 3/4 boarder all around. I cut out little triangles from the corners to help disperse bulges once the pillow is flipped. I also went around the dome and cut off any extra ribbon and added slits all the way around. This was a good time for me to cut off all the extra string too. I gently turned the pillow inside out and stuffed the inside. I hand stitched my opening closed. I added my blue adhesive felt squares and the gem stars too. And how cute is this tab turn out? To enjoy more mosque crafts, please visit 99 Mosque Creative Projects. To learn more about Islam, please visit 99 Muslim Children Books.